If you need a fencing, landscaping or concreting service in Hoppers Crossing look no further than Everlast Services. We have been providing a quality service for over 20 years. Our dedication to the local community is evident in the fact that we manufacture all of our own steel products in our Hoppers Crossing fabrication plant. We are a family owned and operated business and we only purchase and supply Australian made and owned materials. The fact that we fabricate our own steel helps us keep prices low without sacrificing on quality. We have built a dedicated team over the years that have a wide array of skills and significant experience. Aluminium Slat Fencing: If you want a sleek, stylish look with modern lines that is easy to maintain this is the option for you. Steel Fencing: Steel is taking over the fencing world and the best part is, it will last forever. Swimming Pool Fencing: We are versed in all the Australian Standards and know how to make a safe fence that looks great. Industrial Security Fencing: Our quality fences will keep your property safe and allow you to decide who gets in. Colorbond Fencing: This Aussie favourite will give you the best looking fence on the street. Driveway Gates and Fences: We are skilled in all aspects of fencing and gates, we can even provide with the automatic option. Fencing Supplies: If you want quality supplies that are Australian made and owned come and visit our factory. Aluminium Fence Panels: We make our fence panels ourselves so we stand by their quality 100%. Concrete Driveways: Our concrete driveways will add value to your home, give you a clean entry point and last forever. Exposed Aggregate Concrete: You’ll get everything you get out of a concrete driveway and add a beautiful aesthetic to your home. Painted Concrete: Nothing is as versatile as painted concrete. Using stencils and paint you can create whatever look you want all with the legendary toughness and value-for-money that concrete provides. Landscaping Design: We’ll turn your backyard into something so special that you’ll never want to go inside. We can create the look you want for a price you can afford. Landscaping Installation: We can implement all the design elements we help you to create, meaning you only have to deal with one company to take care of your whole backyard. Landscape Supplies: We also stock all the supplies you need for your backyard revolution. 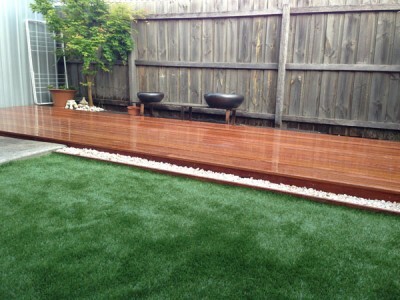 Timber Decking: Every Aussie backyard needs a decking and you wont find a better builder than Everlast. Pergolas: Our steel pergolas will last forever, look incredibly and give you your home a whole new space for you to enjoy.